This week is going to a tough one and I wish you the best of luck dear sisters! I think that this week is so hard to teach because you really just don't want to call out kids that you deem immodest. 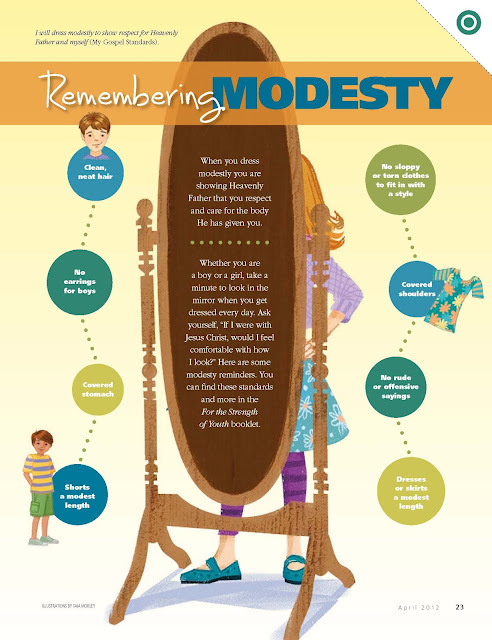 So what I wanted to do for this week it to share the WHY behind modesty. "Modesty is at the center of being pure and chaste, both in thought and deed. Thus, because it guides and influences our thoughts, behavior, and decisions, modesty is at the core of our character. Our clothing is more than just covering our bodies; it reflects who we are and what we want to be." "The next time you approach the temple, pause to look at the temple grounds. Have you ever considered why the temple is surrounded by beautiful plates, reflecting pools, and architecture? They give an outward presence and feeling that prepares the patron for the sacred ordinances that await inside the temple...Our clothing is equally important. It is the "landscaping" for presenting our bodies as temples. Just as the temple grounds portray the sacredness and reverence for what takes place inside the temple, our clothing portrays the beauty and purity of our inner selves." I really just want to print Elder Hales talk and just blow it up and put it up everywhere so that we cam always remember why it's so important to be modest. Now when he said 'landscaping' it got me thinking that maybe just maybe we can use that to help these precious children WHY we dress modestly. Now due to copyrights and me not wanting to me sued, you will need to do a Google search for two pictures. A house with a messy, unkempt yard and another of a clean, manicured yard. Below are links to a couple pictures I think would be just perfect comparisons for the lesson. Print these out onto full sheets and at the beginning of your lesson ask "which looks more inviting?" "which would you rather spend time playing in?" "Why is it more inviting/do you want to play there? Write the children's responses and add your own if you like. By just looking at this picture -hold up the manicured lawn- we know that this owner loves their home and wants to take care of it. Just like this lawn, we can show Heavenly Father that we love and are grateful for our bodies by taking care of it. One way we can take care of our bodies is by dressing modestly. As we dress modestly we invite the Spirit to be with us. 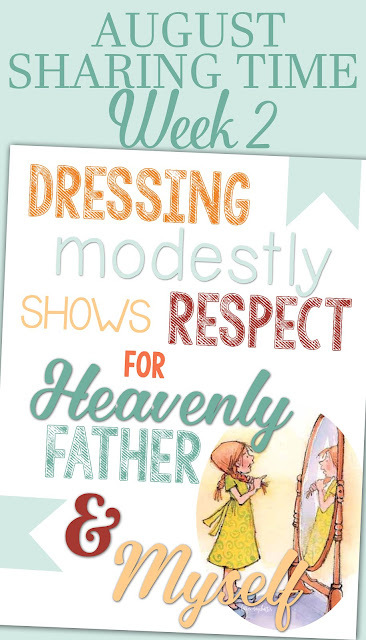 When we choose to dress modestly we send a message to those around us that we know who we are, sons and daughters of God. I also found this article in the Friend that I think talks about modesty beautifully without getting into the clothing too terribly much. To add a bit more to your lesson you can bring in items to represent each point and have the kids pick the items then discuss. Courage to Choose Modesty - this talk is AMAZING and clearly goes over the doctrine, many of this is more for parents than children but I think you can add and incorporate it's teachings.